We long for human connection. How we find it is the catch. Sometimes all it takes is proximity. In Jean Ann Douglass' delightfully beautiful The Providence of Neighboring Bodies, two neighbors share a morning beer and a lovely chat in their neighboring balconies. But when one has a furry friend visit, their newfound bond splinters. 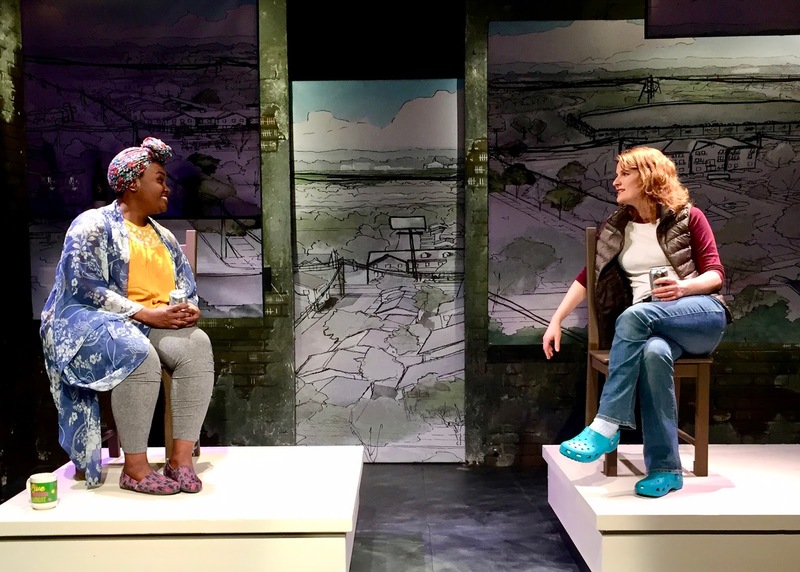 The Providence of Neighboring Bodies, produced by Dutch Kills Theater, is a poetically colloquial interweaving monologue play that showcases Jean Ann Douglass’ delectable writing. Dora and Ronnie are neighbors. They lead different lives but one morning, they share a moment together on their respective balconies. As the day goes on, an ad Ronnie posted for a guest to rent out her couch is answered. The guest arrives. And it’s Jane. A beaver. Through an absurdist view of human connection and perception, The Providence of Neighboring Bodies is a quirky dramedy that strikes the right chord. Douglass has an innate ability when it comes storytelling. There’s a specificity to the characters and how the talk to one another and to the audience. There’s a heightened sense of theatricality that Douglass infuses into her play and even when the story takes a surrealist turn, Douglass’ voice is still prominent. Monologue plays are hard. Douglass has destroyed that notion. Where she slightly stumbles is the perception of the themes. They are clearly present yet not prominent enough to feel intentional. In the grand scope of the play, it’s only a minor blip. The Providence of Neighboring Bodies is a clear-cut character showcase. Jean Ann Douglass has crafted three beautiful characters, passing them off to three talented women to bring even more life out of them. As Dora, Lori Parquet bubbles optimism with a radiating smile. She captures the essence of Dora, finding hope in another and loss when it dissipates. Parquet is a natural storyteller, with a soothing vocal. Give her a phone book and she’ll make it sound like poetry. As her neighbor Ronnie, Amy Staats plays a woman needing a connection anyway she can find it. Staats takes an opposite approach for Ronnie, amplifying the neuroticism and fear of closeness. Yet Staats exemplifies an characteristic that anyone watching has felt. Staats and Parquet have a beautiful bond on stage. Taking on the odd ball of the bunch, Dinah Berkeley as Jane embodied the character. She was able to balance the animal with the human. With the strong sense of story, there was never a moment you wondered her purpose in this world. Directed by Jess Chayes, The Providence of Neighboring Bodies was a consistently touching. Chayes allowed the words to marinate as they floated through the space. She insured Douglass’ specificity of dialogue told the story that was found on the page. The staging was simple, utilizing the simply surreal set designed by Carolyn Mraz. At first glacne, two chairs on two platforms don’t resemble neighboring balconies but as the story unfolds, Mraz has provided the tools to create it in your mind. The drawings on the walls of North Providence were cool. The slightly cartoonish feel set the tone well. The incorporation of the original music by Chris Chappell was interesting. It was integrated as underscoring but didn’t quite have a consistent vocabulary in the way the world moved. They being said, when you discovered it, it brought out a new layer to the play. The Providence of Neighboring Bodies is a rare beauty. Jean Ann Douglass has crafted a play that exemplifies human connection in a manner that is subtle yet profound. Don’t be afraid of the structure. These monologues are fully satisfying.